During our ten day stay on Barbados, aside from the very brief, and occasional tropical shower, there was only one true rainy day. What a great opportunity to take the obligatory tour of the Mt. Gay Distillery! (It isn't really the distillery, but rather a tour facility.) No matter, a rainy day was a fine time to sample some of the country's famous libation. We drove the forty-five minutes to Mt. Gay only to learn that it was closed, unscheduled due to "end of the season, mon". Oh well. We decided to continue on to see what we could see. I had read about the Ostins fish fry held every Friday night, so we plotted our course. The bad news is that the street signs and the road maps of Barbados are poorly designated. The good news is that Bajans are some of the nicest people on the planet and are more than delighted to help you on your way. We drove through Bridgetown. Skip it, especially in the rain, unless you’re checking in on one of your off shore bank accounts. Eventually we happened upon Ostins and its famous fish market. The downpour pretty much dampened any thought of our partaking in the weekly Friday night fish fry. We decided to do the next best thing, and buy our own fish. I was about to buy some mahi mahi fillets when all of a sudden a local fisherman sauntered up to the counter intent to sell an enormous, whole red snapper he held in his hands to our fishmonger. Snapper won. We were leaving the market stalls about to brave the rain to the car park when an elderly Bajan woman yelled at me, "Come over here darling!" I shyly walked over the old woman. She took my left hand and said "How come you not married?" I replied, "I'm engaged, does that count?" "Not to me" she replied as she winked at Anne-Marie. Then with a hearty laugh she pulled me towards her and landed a big kiss on my cheek and said with a smile. "We love Americans. Enjoy your stay." Saturday we checked into Ocean's Edge at Merlin Bay. This was not only our first villa vacation, but our first villa vacation with a full-time staff. How obtrusive would they be? How much privacy could we expect? Uncharted territory. Lillian our cook and Pauline the housekeeper greeted us, albeit demurely, but with great big beautiful Bajan smiles. They quickly made us feel right at home by giving us a tour of the villa and asking us about our particular needs. I piped in with "Let's see how the days unfold. Would you mind, though, making us Flying Fish for dinner tonight? Oh, and where's the blender? And, how is the ice supply?" After that, clearly communicating your needs assures you a wonderful experience. 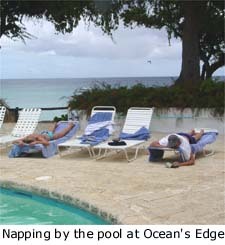 Days at Ocean's Edge were spent lazily around the pool, reading books, taking naps and of course swimming. We played cards and board games too. While in Barbados no matter how late we stayed awake the night before, we were always up with the birds, swimming quietly in the ocean. We would make our own breakfast before the ladies arrived in the morning, but they cleaned up after us. If we weren't going out for lunch, Lillian would come out to the pool and ask us what we wanted for lunch. If we didn't go out for dinner we would have Lillian prepare dinner for us and leave it in the oven. Long after the ladies went home for the day we would reheat our dinner when we were ready to sit and eat. Some of our more memorable dinners prepared by Lillian included her pumpkin soup and sweet dumplings. Oh my! I'm still trying to duplicate her Indian chicken curry, though with marginal success. Undoubtedly the more memorable moments of the entire vacation included having evening cocktails and watching the turtles feed a mere 10 ft. from shore. One evening we joked about how we should rewrite the villa description to read. 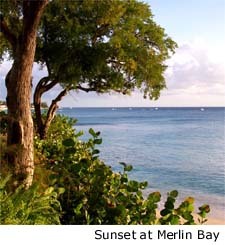 "Enjoy sunset cocktails while watching the sharks feed on the baitfish on the beach below." We felt we had found a little slice of heaven, and we weren't ready to share it with everyone. One evening we did reconnaissance for Tiger Woods and enjoyed sunset cocktails at the clubhouse up at the Sandy Lane golf club. No problems here, Tiger. 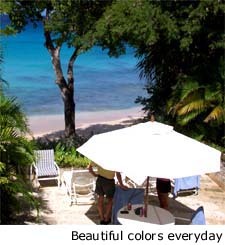 Having lunch and drinking cold beers under the thatched roof with our toes in the sand at Cocomos was divine too. Anne-Marie and I went scuba diving four times. Aside from the Fish Pot, our favorite meals out included Olives and Ragamuffins, both located in Holetown. One night we dined at the Lone Star. Housed in a former garage, the Lone Star is the latest darling in the British media for those affected types that find it more important to be seen rather than be delightfully surprised when forking over ungodly amounts of money for dinner. On a lighter note, in the British West Indies roti is what hamburgers are to Americans. I asked several locals where the best roti was to be found on the island. Waiters, bartenders and housekeepers alike all replied "Oh, you gotta go to Chefette, mon". The roti was so good that we brought it on the plane with us for our meal on the flight home. As this was my first bona fide villa vacation, I now truly understand why so many of our clients rebook the same villa, year after year. 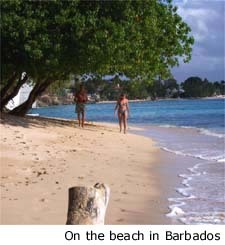 Anne-Marie and I have already rebooked our return to Barbados.